In his interview with VIMA, Patriarch John of Antioch highlighted the necessity of international mobilization for peace in the Middle East and the release of the two bishops of Aleppo who were kidnapped 18 months ago on the Turkish-Syrian border. The primate of the Church of Antioch, based in Damascus, lives these tragic circumstances every day and characterizes the two kidnapped bishops as “apostles of peace.” Even more tragic is that the drama of the kidnapping takes place within his family, as one of the two abducted hierarchs is not only his spiritual brother, but his brother according to the flesh. “They do not frighten us,” he stressed and expressed his love for the Greeks shortly before his meeting with Prime Minister Antonis Samaras. 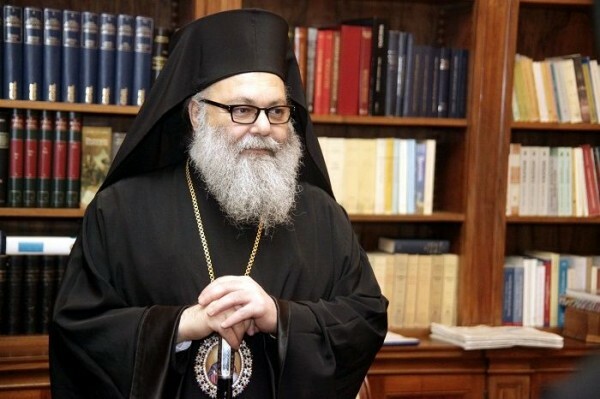 Patriarch John, who has been on an official visit to the Church of Greece last Thursday as part of the customary eirenical visits as a new primate, is having ongoing meetings with with Archbishop Ieronymos and in the coming days will visit Mount Athos, where he lived during his studies in Greece. Your Beatitude, you are coming from the most troubled region in the world right now. What is the situation of the Christians in the Middle East? First, I want to express all the love, joy and honor I feel to be in Greece. We in the Patriarchate of Antioch, in Syria, Lebanon and Iraq, throughout the region, as you know we very much love Greece and the Greek people and we wish you the best. Greece is a beloved place for us. We are living in very difficult conditions. Particularly in Syria, churches, mosques, shrines and monasteries have been destroyed, but our faithful Orthodox Christians remain there. They still live there. We are about 1.5 million Christians in Syria, where we live in every city. And we are living normally, despite the difficulties. We bear them and hope that this cloud will pass as quickly as possible. Two tears ago, when leaders of the Patriarchate of Antioch stated that the jihadists have nothing to do with the tradition of Islam in the Middle East, many people listened attentively to these statements. It is a foreign spirit. There was never such a spirit in Syria or in Lebanon. Sadly, this phenomenon has come from outside and certain major powers bear some responsibility for this. This extremist phenomenon, which has reached the point of them killing each other in God’s name, had never existed. It is not accepted by anyone. Neither do Muslims accept it. Do the Muslims also have problems? There is my brother and another bishop. Two bishops from Aleppo who were kidnapped a year and a half ago and the whole world keeps silent. They don’t know anything, they say. No country says what is happening. Who knows about this story! Both are lost. At the same time, we are all talking about human rights. Where are people’s rights when you do not speak out? When do you not say a single word about such an issue? And if there are some people who think that such an event will frighten us Christians because they are kidnapping and disappearing our bishops, our priests and members of the Christian communities, they should know that these threats do not frighten us. Orthodox nuns were also kidnapped. After six months they were released and returned to the monastery. What moved you about what they experienced? These things are not spoken of. They are a matter of monastics’ confession to their pastor. Your Beatitude, what would you wish, how do you see the future of Christians from now on? We always have hope. We remain standing and strong despite the trials. We do not want to repeat what happened in Iraq, where the Christians slowly started to disappear. Where there had lived 1.5 million Christians, today 300,000 live in the country. I understand from what you are saying to VIMA, you want an international mobilization to protect the Christians in the Middle East and rescue the two bishops. This is the main thing that must be done. We need help and support. The two hierarchs are apostles of peace and we hope that their physical condition is good and that we will be together soon.